Which architectural software is right for me? Which CAD or BIM software should you use? Well, that depends. What functionality to you need? What are your priorities with regard to cost, comparability, interoperability? 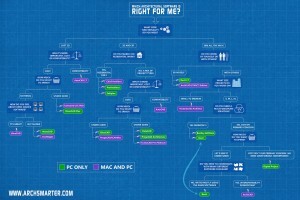 Are you using a Mac or a PC? Determining which software to use can be a tricky process. There are a lot of choices our there and the marketing material doesn’t always help you understand your full options. Not to mention, software is an expensive tool that is essential to your work. You need the right tool for the work you do but you also don’t want to spend money on features you’re not going to use. 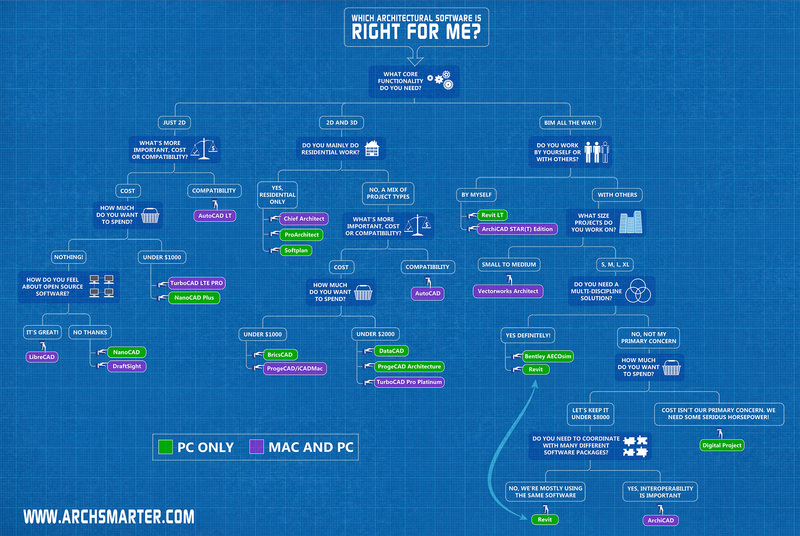 I put together the following flowchart to help you select the best software based on several criteria. The criteria listed are based solely on my opinion either using the software or through my own research. I’ve included a list of all the applications and their websites below. If I missed any programs, please let me know in the comments and I’ll update the flowchart accordingly. The table below lists all the software included in the flowchart. With Rhino you can model and document your designs ready for rendering, animation, drafting, engineering, analysis, and manufacturing or construction. That’s a good point about Rhino. I am a big fan of the software. I didn’t consider it for this round because I feel it’s used primarily for 3D modeling, less so for 2D drafting. I’m know there are some architects and designers using it for both 2D and 3D though I suspect they are in the minority. The same goes for SketchUp. I will take a look at VisualARQ though. Thanks for the link. Great Analysis, Mike! Finally an objective, intelligent comparison of BIM/CAD softwares! The industry leader has tried to convince the entire architecture profession that their one size fits all! Sadly, many have bought into their myth only to see their BIM investment sitting on the shelf. A few other criteria selection items might be: Ease of learning and amount (in hours) for customization. The office I currently work in will spend about 1,000 hours (our first year) customizing Revit for use in residential projects. While Softplan (which I have used as a sole practitioner) took about 100! Many offices require a full time BIM manager to customize their program. If this can be absorbed by overhead and profitability, great. If not, it is a burden! Architects, especially small practices, need to know their a better “fits” for their needs! Thanks for the comment. Great suggestions on additional criteria and you gave me an idea for a future post. Since that type of information isn’t readily available from the software marketing material, I think it would be really useful to do a survey on what software people are using, how easily they learned it and how much time and money they spent to get up and running. That type of information would be helpful to factor in when choosing software. Thanks again! Absolutely! I am at the very beginning of this process and I am nearly a complete dinosaur when it comes to the right software for a novice. I have tried to teach myself several programs including, Autocad, Revit and Chief Architect. Chief was the easiest to learn but it is so expensive to purchase. I need something for my one man practise that is nearly universal and relatively easy to afford. Thanks for this great site! In a similar position to you. How did you find Revit and AutoCAD for a learning curve ? WOuld you recommend one over the other? Very nice report and graphics. This should be very beneficial to anyone reviewing costs. Having worked for a (130+ person) firm using AutoCad (now Revit), I went back on my own and learned Vectorworks on a Mac. It might be informative to see a comparison of operating costs of PC’s vs. Macs. It seemed the PC’s were in constant state of maintenance, crashes and updates that affected workflow and productivity. Thanks Vincent. You make a good point about operating costs. There is the initial costs associated with purchasing the software as well as any yearly subscription fees. As Edward mentioned previously, you also have training and setup costs. Then there is the cost of maintaining and updating the hardware. I’ll do some research to see if there’s any data available on PC vs Mac operating costs. It would be really interesting to see a comparison of the software based on the total required expenditure versus available features. Great layout Michael, the graphic is very good. I would recommend though, that you consider Trimble SketchUp Pro as a contender for 2D/3D and BIM commercial collaboration. I know you made mention of it in one of your responses, but I have been using SU Pro for more than a decade now and on 30 million dollar plus projects on both the A/E and the Contractor side with active collaboration between consultants and subcontractors. I understand it may have been looked down upon when Google purchased the software and offered it to the world for free, but the Pro version has always remained a solid performer as an ACAD replacement. I am currently working on a 20 million dollar project and the BIM base model for the project is a SketchUp Pro file. Trimble supports the Pro version with extensive BIM tools and uses it’s own .skc file for importing of Industry Foundation Classes(IFC) data as well as the import of .xsd file types. The program is cross platform, so it doesn’t matter if half your team is on Mac, PC, laptop or desktop. The Layout program handles all of the 2D output from the 3D model and is robust in its own right. Other resources such as the 3D Warehouse and the Extensions Warehouse add functionality to this program that I have not seen in any other software package or platform. I have also used the software for smaller residential projects back when I could not afford to upgrade my AutoCAD 2002 license and the learning curve was very shallow. Our firm has abandoned ACAD and only makes use of AutoCAD 360’s annual subscription to quickly review and markup DWG files that we happen to come across. Since SketchUp Pro reads DWG’s, we simply modified our workflow slightly to incorporate them into our collaboration. For the price, this package has been an outstanding value to our firm. I will definitely give SketchUp another look. I bought Paul Lee’s book “Construction Documents in SketchUp” a while back but I haven’t had a chance to really play around with getting drawings out of the model. I’m curious about the .IFC tools. Can you export as well as import .IFC files? If so, how do you classify SketchUp surfaces as building elements? Paul Lee’s book is a good resource, but you may also want to take a look at Matt Donley book “SketchUp to Layout” at http://www.sketchuptolayout.com/. It is informative and comprehensive in showing how to make 2D representations from the 3D model. You should also take a look at Michael Brightman’s book, “The SketchUp Workflow for Architecture”. In his words “LayOut is the most overlooked and underestimated program I have come across, yet it is the second half of an efficient SketchUp Workflow.” Architect Nick Sonder does some amazing work in his practice showing this type of workflow (http://www.nicksonder.com). However LayOut only comes as part of the SketchUp Pro package, so for the sake of comparison with other CAD or BIM systems, it needs to be included in the evaluation of Sketch against other packages. As for .IFC tools, yes you can import and export .IFC files. SketchUp surfaces in their raw state cannot be classified under IFC, however when they are turned into groups or components they can be classified. One of the first actions that is recommended for any SketchUp workflow, is turn raw surface geometry into groups or components as soon as feasible. This turns these elements from being sticky surface objects into solids, which can then take on all of the BIM metadata found in more expensive software packages. All of the manufacturers that post to the 3D warehouse and many that have posted to Sweets and ArCat have their models as components preloaded with all their pertinent metadata. The ease at which these can be incorporated into ones work is a major time saver. Hope that helps. Great information! Thanks for sharing Ricardo. I’ll definitely take a deeper look. I like the site – keep up the interesting content. From the mid-1990s through the mid-2000s we used AutoCAD LT on PCs with constant maintenance problems. I had had a package of Vectorworks’ predecessor, MiniCAD, unopened for some time, and never yet installed on the Mac that I used to run the business functions of the office. I had not done CAD drafting, so I was unfamiliar with most of AutoCAD LT’s functions — the staff printed hard copies of docs that I redlined. Forced to cut back on staff after a project ended with no others in sight, the only computer left running was my elderly Mac, so I loaded MiniCAD, learned to draft on it in a weekend, and presented preliminaries to my client on Tuesday. I promptly ordered its successor, Vectorworks, and have never looked back. Now, I’m finally looking at its substantial BIM capabilities and learning those. New hires read two slim volumes, do the exercises and gain sufficient knowledge to become productive in a couple of weeks, including most 3D & BIM capabilities. Increasingly producing projects with these features, we are more & more impressed by the value of this program compared to the cost, especially with the short learning curve compared to other applications. That said, I have imported hundreds of docs produced previously in the industry leading software with complete ease and converted copies to Vectorworks files and pdfs to archive, and I have imported scores of details in dwg and SketchUp formats, also converting to the “vwx” file format with no problem. Thanks for the information. I need to do some more research on Vectorworks. I don’t have any experience with it but I’m curious about its BIM capabilities. It does seem like it provides a lot of value for its price. Have been an Autocad user then a Revit BIM user for 8 years now. While the imported objects (called families) can be tedious and complicated to create or modify BIM programs are very good benefit for the drawing production. BIM offer the capabilites to see ahead of time problems that will occur during construction administration. A well executed model will reduce the time to figure out framing/duck problems on site and delay a project. Windows and doors objects linked to the automated schedule is a winner for time saving on producing schedule, same for plumbing. I use it for small or large project and if the program is handled by an expenrienced user it does not make any difference. BIM is also an impressive system to revise drawings. With 2D program, accuracy is never meet and discrapency on the drawings greater making the work for Contractor more difficult, rising cost and delays. Also matching an elevation, a plan, a section and details is countless hours and headache in 2D while BIM provide all in one with the 3D model. On the ither hand one must learn to self control himself to avoid building in 3D when unnecessary and building in 3D to cut time. Smart well produced families in Revit are key for time saving. Many companies also provide BIM file of they products. If I have a choice to move a door 2FT and all of the views gets updated in a second instead of spending time to update my door in elevation/section/plan/Interior elev I prefer the time saving and accuracy of BIM. It is quite astonishing how one can now legally equip office with great combo of SketchUp Make + Draftsight and gain access to grown-up software, backed by large corporations (Dassault Systems and Trimble) and start business without need of commitment to expensive package. I myself jumped on BIM bandwagon right on high school, enjoying every minute of it, but now, as I am soon soon to graduate I am pleased to know that there are inexpensive solutions I can take advantage of. Its interesting, I’m an architecture student and I don’t use any of those programs except revit and autocad — and even then extremely rarely! In school we primarily use Rhinoceros with plugins such as Grasshopper, Ladybug, Weaverbird for more specific 3d results or environmental analytics — then if looking for a way to sculpt or animate digitally we use Maya. Most of our 2d work is exported from Rhino and then manipulated for correct line weights in Illustrator and then edited further in Photoshop. Furthermore, architecture is partially about visualization — and in this regard we use multiple different rendering softwares including Vray (for quick airy visualization with soft shadow), and Maxwell Render (for hyper realism visualization of interiors / exteriors). These photos are then post processed like our 2d work with added lines in Illustrator and editing in Photoshop. Good point Santiago. When I put this graphic together, I focused on BIM and CAD software, with an eye toward production related tasks. I should update it to include 3D and computation design tools as well. Thanks for the input! BricsCAD is available for Windows, Mac and Linux, not just Windows. Its a great analysis and convincing. Would you consider the extension abilities for BIM tech? This might be a factor when architects want to do more works/analysis and improve efficiency. Good point! I’m going to update the diagram shortly so I’ll add a category for API / extensibility. Thanks for bringing this up. Good and easy to understand graphic. Thanks. But, what do you mean with ‘ multidisciplinary ‘. Why is Revit ‘multidisciplinary’ and Archicad not? Peter – The reason I classified Revit as multidisciplinary is because Revit has MEP and structural tools built into the software. I should rename that category as “multidisciplinary toolset”. I didn’t mean to imply that you can’t use ArchiCAD effectively with other disciplines. I’m going to update the diagram shortly so I’ll be sure to correct that. Looking forward to reading your reply! Dirk – Thanks for the comment. A number of people have mentioned AllPlan as well. I’m going to update the diagram shortly and I’ll be sure to include it in the new version. Thank’s a lot. I am tuned to seeing the new diagram. I like it a lot! I found it helpful for architects and designers for evaluating the different criteria when it comes to choose the right software tool. Edificius in the flow chart too. We are available for any kind of further detail and question. Yo trabajo con ARCHlineXP y pienso que podría incorporarse dentro de la relación de software BIM. Poco conocido, pero creo que muy eficiente en su versión arquitectura, fácil de manejo y con un costo muy proporcionado. I am an architecture student (in Kenya), just started my course, and I really appreciate this discussion. it will really help me in choosing which software to major on. I hope I will one day work with people in this forum. Most of the structural engineers I know use some combination of Revit, Tekla and / or AutoCAD. Please take a look at Nemetschek Allplan and Edificio. Hi first,great work on this article, but I think you should concider Vectorworks for 2d ,2d/3d, and. 3d only plus the BIM, part I have used Vectorworks for about 10 years and is a great software, easy to use and to learn, quick to do daily office work, great for rendering using Cinema 4E. Hi, have you heard about Arcon Evo http://www.arcon-evo.co.uk ? My architect used to project my house with garage, so I thought it might be worth considering. GstarCAD has been a very popular alternative to AutoCAD in more than 120 countries. You should check it out. Thanks Brian. I’m in the process of updating this infographic. I’ll definitely take a look. Not sure I agree with the chart. You could easily conclude that in 2D and 2D/3D that Vectorworks, Bentley, or AutoCAD could be the preferred option ultimately. Compatibility through exchange of DWG data is pretty easy in almost all software (although easier in some than others… thinking Bentley’s transparency to DWG) and it looks like you seem to believe that the only way to be ‘compatible’ is to use Autodesk products, which as we all know is NOT a given. I think it is incredibly misleading. I concur. I’m not sure I’d claim Archicad more interopberable than Revit, in my experience it doesn’t play well with anything else, but Revit I can get into our out of with almost anything. I’ve never worked with an M&E or structural firm that even had Archicad, muchless used it for production. For pure in house work with no consultants that you don’t need to interoperate with anyone outside, ever, Archicad is great, if a cad workflow shoehorned into BIM. The flow chart also ignored workflows, content of output and parametric controls, which are critical parts of choosing software. For 3D architectural work AutoCAD Architecture should be mentioned, and the fastest I’ve ever turned out pure residential work was in Revit. Similarly, for small retail tight prototype work vanilla AutoCAD excelled because it was draw box, place blocks, rotate blocks, stretch parametric shelving block, done. Very interesting chart and reading responses. As a Mac user since the 80’s, I went with VectorWorks in the 90’s. I am not technically proficient but have to say as an Interior Designer, VectorWorks is a PITA. Looking for new software and came across your site. I was flabbergasted when I downloaded Chief Architect trial version for Mac and saw all of the areas missing for Macs that PC users have! Takes me back to Quickbooks. Oh well — thanks for your time! The newest version of Chief Architect has very few differences in functionality outside of how the operating system (Mac vs. Windows). There is a list on the Chief Architect System Requirements page that outline what is different between the Mac and Windows version. This list currently includes the following. Here is a link to the system requirements page that will have the most up to date information. Since you plan to update, I’m comparing DataCAD to TurboCAD, and notice that TurboCAD Pro Platinum 2016 also has BIM. Chief Architect Design is THE BEST BIM!!! Not clear on what criteria you have used to evaluate and categorize these software packages, and whether you have actually used them professionally. For example, you set up categories for BIM usability related to either working alone or in groups (ok, that’s something packages support or don’t) and project size – what is small, medium and large? For example, our office uses both Revit and Vectorworks, but we have used Vectorworks successfully on projects exceeding $20 M without challenging its limits. Possibly it would be more valuable to actually compare features that would impact software applicability – availability of a variety of parametric tools, organic modeling, ease of use and learning curve – something with a little more meat than “s, m, l, xl”, which provides very little valid information for comparison at all. The core functionality split is the first big fault. BIM is *NOT* just 3D. If you want 3D buildings on a computer AutoCAD Architecture is great. Why you’d leave out the 2nd highest market presence software in architecture is beyond me. Using parametric modeling with the ability to do component data analysis and have smart elements is a critical choice. It’s reinforcing thinking like this that BIM is just 3D CAD that makes it difficult for BIM professionals to educate folks who are starting out in BIM. I’d start out with “Do you need the accuracy and time savings that 3D can produce?” to split off to the 3D options, then “do you need to extract data from the file, and automatically schedule and generate components based on related content?” to split to true BIM vs the 3/4 BIM/3DCAD+ softwares. I hope your site does well -I think that we need better evaluation and comparisons in building design software. I will add that ChiefArchitect and Softplan are both capable of commercial design (even though it is not their specialty) but lack some collaboration tools. Also I think a lot of people consider material estimating to be BIM and both do that. For Sketchup there are a lot of third party apps made primarily for building design up to the very comprehensive PlusSpec add on. If you’re in Nigeria can we meet up? I’ve been looking for someone like me here in the country. The designing software which I like most is AutoCAD and Catia. These are two software which we can use to make drawings easily. I also tried Creo but not like much. Michael, Did you ever update the flowchart? Not yet! But it’s still on my to-do list. Great post, I love the flowchart! I think a top software missing from the 2D and 3D residential section is Arcon Evo’s professional house design program. You can create stunning 3D visualisations and the 2D aspect is brilliant. Most people obtain planning permission with the 2D house plans they create within the software. It is widely used by architects. Do you think it is worth adding? Very useful tips. Excellent stuff. Thanks for sharing. Well, since other people are still seeing this and commenting in 2018, I’ll add my $0.02. I fully agree with your analysis and placement of ACad LT and Chief. I learned and use ACad LT daily. Several years ago I purchased CHief Arch X6 for the 3d modeling. Hands-down Chief is the easiest to get into for quick modeling of a house. When you’re getting into higher level detailing I prefer ACad LT though as I’m far more effective with that. For an entry level RESIDENTIAL designer, get, and become proficient at, Chief Architect. You can still buy standalone seats, and it’s a “reasonable” cost. I really believe it is the future for res home design and excellent output for customers/clients/builders for seeing pictures as they will be constructed in field. Thanks for the comment. I haven’t used Chief Architect but I will definitely give it a try. By any chance do you have a similar chart to choose a render engine? It focuses specifically on rendering plug-ins for Revit. Please have a look, Michael.